ADOM (which is short for Ancient Domains of Mystery) was released by Thomas Biskup in 1994. Its main features are its detailed storyline and its undisclosed source code, both of which are unusual in the Roguelike world. 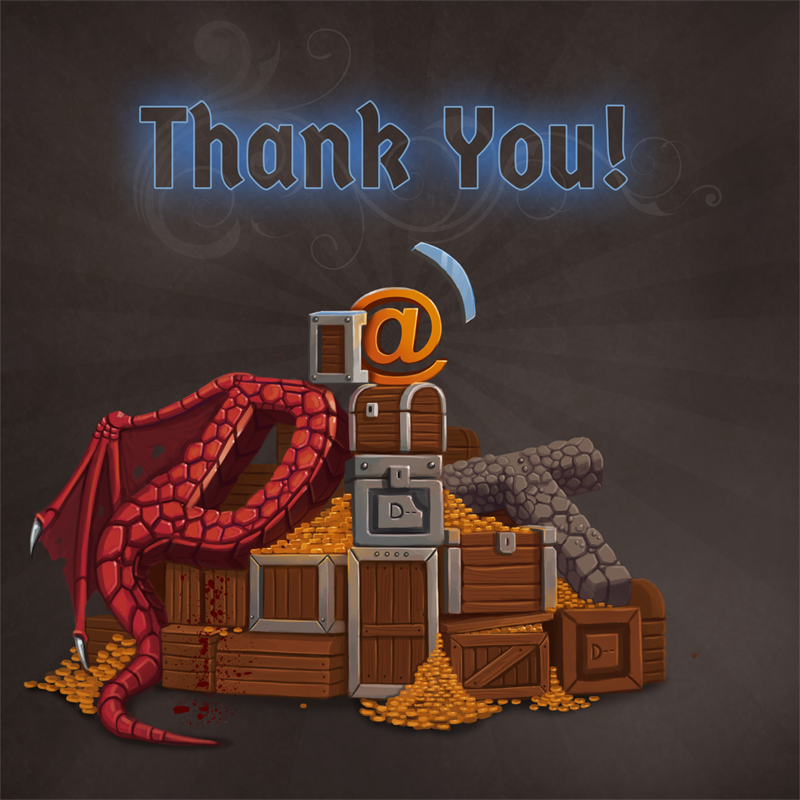 During 60 magical days from the 2nd of July to the 30th of August 2012 ADOM was resurrected from its hibernation by the amazing success of an Indiegogo crowd funding campaign. $90,169 were collected over the course of 60 days, making ADOM the most successful crowdfunded game ever on Indiegogo and the most successfully crowdfunded Roguelike game ever (if you count Dwarf Fortress as being crowdfunded ADOM is only 2nd, yes ;-) ). As a consequence, a series of major new releases of ADOM is being implemented while you are reading this and there will be tons of new items, artifacts, quests, classes, races, maps and even such things like graphical tile support, sound, a Steam integration and an achievement system. So the future once more looks very bright for ADOM! 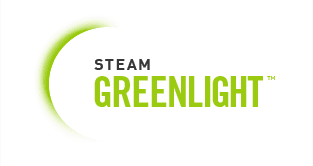 On May, 16th, 2014, ADOM entered the Steam Greenlight process. 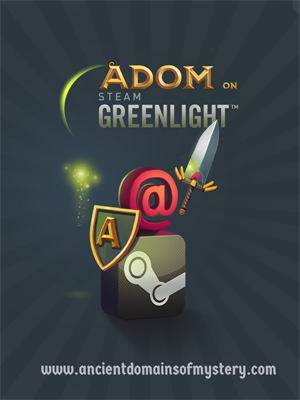 On the 11th of June, 2014, ADOM was greenlit! Additionally, there is now a Steam group for ADOM discussions. 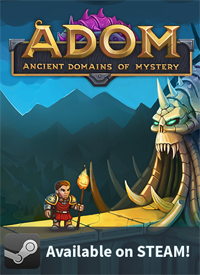 Starting November 16 2015 8pm GMT+1 ADOM has been available on Steam. In 2019 a Kickstarter campaign was launched to fund the release of the ADOM pen & paper roleplaying game. The RPG will consist of two rules manuals. Details can be found at the aforementioned link. The game is set in the world of Ancardia, an original creation by Thomas Biskup. The objective is to find the source of chaos and disorder that is arising in the world, and stop it if you can. The game is much more plot driven than many other Roguelike games, with many beings in the game assigning you quests, giving you advice and helping you on your way. There are a few compulsory quests, but the majority of quests and tasks in the game are optional. There are also multiple possible endings to the game. The character starts at the top right corner of the wilderness map, and encounters the village of Terinyo as the first stopping point (if he follows the road). One can get food, quests and shelter here before proceeding to the dungeons of the game. ADOM is classed as a 'hack game rather than a 'band game, mainly due to the semi-persistent levels present in most of the dungeons. When the player enters a new level, the layout for that level is then used for the rest of the game. If the player leaves a level, and then returns, he/she will find the level exactly as it was left. There is one exception to this - the Infinite Dungeon, which generates a new level every time stairs are used. However, many of the more interesting game features, such as altars, vaults and shops are never generated in the Infinite Dungeon. All dungeon levels are either the same size as the screen or smaller, so no scrolling is required. The main dungeon of the game is the Caverns of Chaos, a 50-level deep dungeon, with a few key special levels located there, including the main town of the game - Dwarftown. There are several smaller dungeons too, most of them being part of a quest in some way. ADOM has ten playable races, and twenty playable classes. Any combination of the two is possible, though some combinations are not recommended. Races - Humans, Trolls, High Elves, Gray Elves, Dark Elves, Dwarves, Gnomes, Hurthlings, Orcs, Mist Elves, Ratlings and Drakelings. Classes - Fighter, Paladin, Ranger, Thief, Assassin, Wizard, Priest, Bard, Monk, Healer, Weaponsmith, Archer, Merchant, Farmer, Mindcrafter, Barbarian, Druid, Necromancer, Elementalist, Beastfighter, Chaos Knight, Duelist. All classes are able to use magic and all classes are able to use any item they should choose, but will receive appropriate bonuses/penalties to their abilities. Wizards and Priests will obviously learn magic far more easily than the fighting classes. However, the fighting classes will gain weapon skills far more easily. Races and classes may also have their own special abilities. In the most recent version, players receive one or more talents at birth (depending on race, class, horoscope, mana and luck), and have to choose a further talent every three levels. These talents give pluses to stats, skills and grant other abilities. ADOM features a large number of spells ranging from useful Light to mighty Wish. Spells can belong to arcane or clerical schools or both. Casters have a harder time learning and improving the effectiveness of magic from the other school. ADOM treats most ball spells in a unique way. Each ball is centered on the player character but does not harm him. During course of game character gets more and more corrupted until final challenge is defeated. Corruption builds up slowly until it is strong enough to manifest in body. Few of effects are beneficial, most are mixed blessing and some are outright harmful. When a PC gets extremely corrupted he turns into a writhing mass of primal chaos leaving his former existence behind to become a lowly minion of Chaos. ADOM Classic (the public release) currently is at version R101 (version 3.3.3) and freely available for Windows, DOS, Linux, OSX, NetBSD and Amiga (FreeBSD support has been dropped with R101 due to the rotten state of FreeBSD which makes updating the OS a major pain). ADOM Deluxe (the Steam release) currently is at version 3.3.3 (release 101) and available for Windows, Mac and Linux/SteamOS. ADOM Deluxe (the GOG release) currently is at version 3.3.3 (release 101) and available for Windows, Mac and Linux. Unlike most Roguelike games, the source code of ADOM is not freely available, though many guesses, deductions and experiments have allowed the players to deduce the majority of the game's workings. The official website can be found at ADOM. Also contains download links, the official forums and Thomas Biskup's blog. Andy William's Guidebook (containing spoilers, detailed information, and much more, but no longer updated and only contains information up through version 1.1.1) is located at The ADOM guidebook. The ADOM newsgroup is another great source for information or getting a question answered. It is recommended you use a better news client, but you can access the newsgroup through Google Groups. This page was last modified on 30 January 2019, at 01:18. This page has been accessed 284,984 times.